SoapStandle: A Bar Soap's New Best Friend. SoapStandle! We've said that word probably close to 100 times this week. Our shipment of these super useful bar soap accessories has just arrived and we can't wait to share. We have already started using one for each of our scrub me™ soaps at home and now we feel like the bars just wouldn't be the same without it. This super genius soap saver prolongs the life of our soap, provides the bar with a small grip, and keeps the soap from sitting in a gooey puddle. scrub me secret: a soap saver is a small dish or pad that bar soap is set on so it can dry better. a typical soap saver elevates the bar a bit and allows most of the soaps surface area to dry. the only problem is that a small part of the soap is still touching or resting on the dish or pad; water residue is left on those parts of the soaps allowing bacteria to temporarily live and your soap to disappear faster. 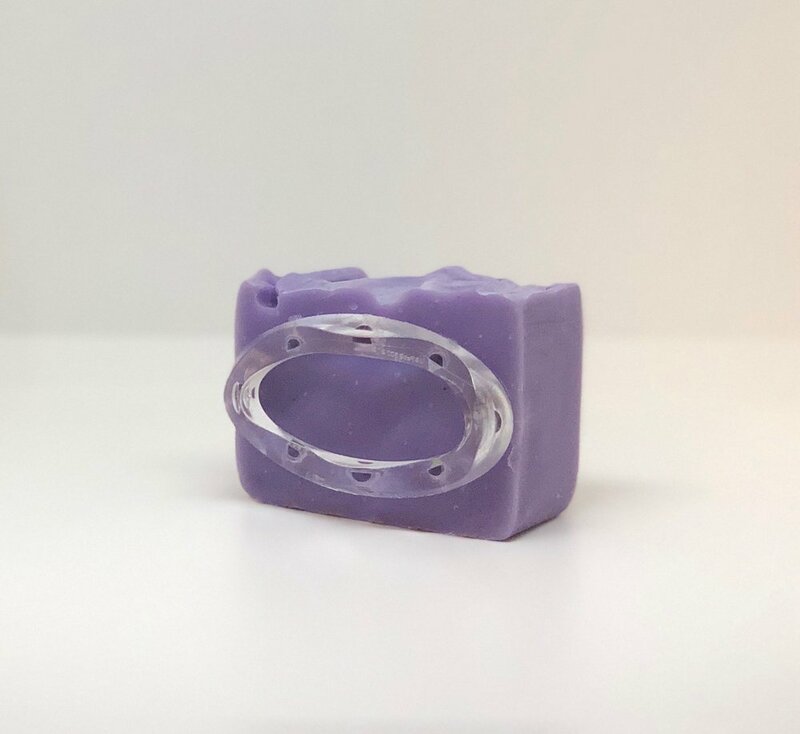 This nifty little plastic ring isn't your typical soap saver. There are small teeth that follow around the edges of the ring that easily fasten to your bar soap. After it's hooked on your bar, consider it one with your soap. The SoapStandle will stay attached to your soap bar until you are finished with it. Remnants from the last bar can easily be rinsed away before you use it again, or you can detach the SoapStandle from your cleanser whenever you feel like you want to switch to a new one. scrub me secret: we love using one for the soap we keep by our kitchen sink. since we don't like washing our hands with dish soap we always keep a scrub me™ bar in the kitchen (preferably a man soap). a SoapStandle helps us pick up and grip our bar quickly and easily while we have wet or soiled hands. the best part is we can just set it back down wherever we please with no soap residue left behind on the surface. If you're like us, your soap bars are precious to you, especially the scrub me™ bars! A SoapStandle will not only help your soap last longer but it will also ensure freshness of the bar. 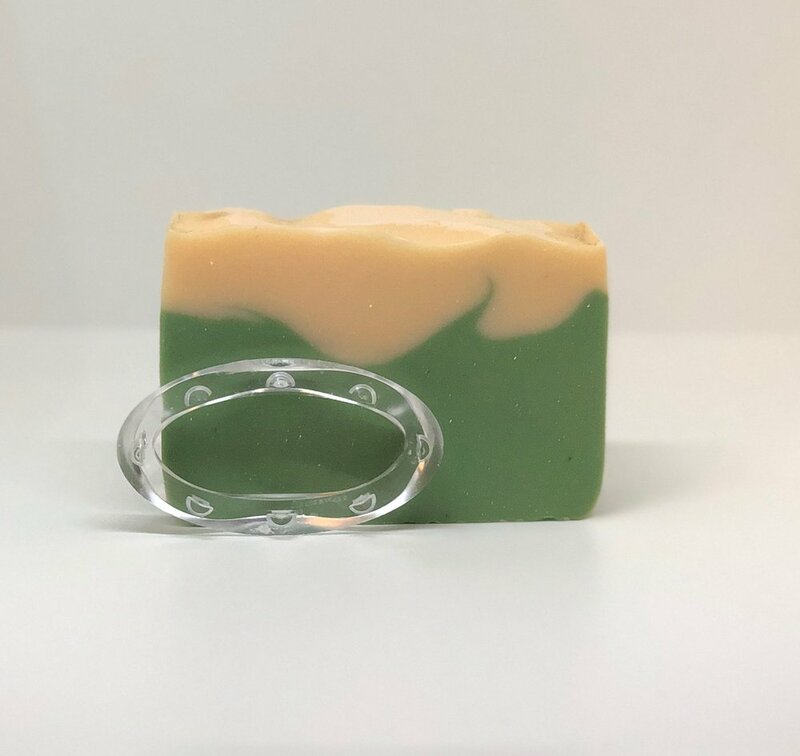 The small ring allows the soap to be elevated without actually sitting on a surface. This helps a 360° air flow all around the soap. Say goodbye to your soap sitting in a gooey puddle! You won't feel like you need to rinse off your soap before using it. scrub me secret: a SoapStandle is especially great for facial bars. Since the skin on our face is more sensitive and prone to breakouts we like to make sure the facial bar we are using is 100% bacteria-free. we feel much better about using a facial cleanser that doesn't have to sit on a dish or soap pad. Adds a little helping handle to your soap bar. Another benefit of this useful little tool is that it provides a small grip, or "handle," for your slippery soap. We found this to be great in all situations. Shower soap, kitchen sink bars, guest bathroom soap, you name it! Where can I find a SoapStandle? Look for SoapStandles coming to our site for purchase 8/1. From now until the end of the month we will be gifting a FREE SoapStandle with every online order over $40. You can also find these in packs of 2 at soapstandle.com Help your scrub me soaps live a longer life! Perfect fit on our mini, soothing soap. scrub me secret: we tested one out on our mini soap bars and it still worked perfectly! great item to throw in your "on the go" pack when traveling.